Just yesterday Jim retweeted Psychmedia‘s find. 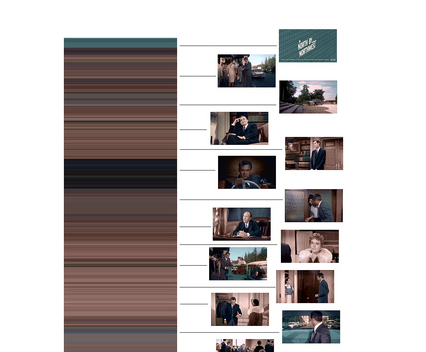 Essentially, this post shows the first 1000 frames of North by Northwest by average color. Give someone the image. They tell the story based on the colors. The key here would be to map the writing to the image bands in a way that keeps it contextual. It also be nice to be able to stack columns of different interpretations out horizontally to see the different interpretations of the same bands. Take three movies and break them down this way. How do the colors compare? Why do you think that’s the case? You could break down three movies from the same director and look for matches or just do it randomly. It would also be wild to produce your own movie with this kind of color breakdown in mind. If you knew people would see this, what color choices might you make? I’d try to send odd codes or make the average colors very misleading. I love this sort of odd data display for common items. It reminds me of the really wild text arc stuff. I love that potential to look at things in odd ways. Even if it doesn’t end up making sense (Dan’s toast brightness values), I think you gain something in the pursuit. 1 It’s worth noting that you could do all of this in an English classroom and get at some really serious analysis. You could even reverse things and have students create the color graph for a novel. What would those colors be in the movie? Explain your choices. I’ve been posting a lot of garbage animated gifs on here, essentially just reveling in the chaos of what can be made. After reading Alan’s post I decided to publish something a little more serious and a little more in line with the spirit of the original challenge. The movement is minimal. The eyes convey just how freaked out Arnold is at this moment as the alien climbs right next to him. This scene is from Predator. That was back in 1987. I remembered the eyes, although it took me a while to find the scene on the internet. In my head I actually confused it some with this Rambo scene. Anyway, I love the creepy feel and think it’s closer to the original spirit of the challenge and the If We Don’t Remember Me site.